"Consider yourself lucky. I could have done much worse than web you to a streetlight." Widow is an athletic young woman with long brown hair. In her guise as Widow, her entire body is covered by a thin layer of extraterrestrial nanotechnological goo. The goo can take on any color or texture, but because of the neuroses of the previous wearer of the goo, it now tends to display itself in ways that represent spiders. Because of the symbiotic nature of the entity, Charlotte is always wearing it, even when in street clothes. At these times, it takes on the color and texture of underpants. Charlotte is smart and outgoing, and she loves helping people. Charlotte enjoys being Widow because it gives her opportunities to be adventurous while making the world a better place. Enthusiasm: The character is reckless and enthusiastic, and may be young and naive. Enemy: Charlotte may be mistaken for the infamous Scarlet Spider. Charlotte McCoy is the daughter of Jonathan McCoy and Wendy McCoy, of Oak Brook, Illinois (a suburb of Chicago, Illinois). Charlotte has an older brother, Jacob, whom she has always idolized. When Jacob focused on the natural sciences and physics at university, Charlotte focused on chemistry and forensic science. When he had a life-changing experience and began to participate in "extreme sports", so did she. Charlotte wasn't in competition with him: he was her role model. With "extreme sports" come extreme risks, and after a particularly bad fall during a freestyle motocross competition, Charlotte found herself in the hospital with a mild concussion and several broken bones. As luck would have it, she was being wheeled into the emergency room at the same time as a local photographer, Carson Cross (ex-husband of the famous model and actress, Mary-Elizabeth Bell), who'd suffered a gunshot injury. What no one knew was that Carson Cross was in fact the infamous Scarlet Spider. As Cross died, the extraterrestrial nanotechnological goo that granted Cross his Scarlet Spider powers sought a new host. Charlotte was the nearest candidate. Frightened and confused, both Charlotte and the entity fled the hospital. Later, authorities theorized that the Scarlet Spider had attacked and kidnapped Charlotte for reasons unknown. The Scarlet Spider had a history of irrational behaviour, so this was a reasonable deduction, given the facts available. Eventually, Charlotte and the entity came to an understanding. She learned that the entity was designed by an alien race as a protective covering for space exploration, and that its original host had perished many years ago. She sensed a great relief that it had finally found a human host not plagued by insecurity and depression. 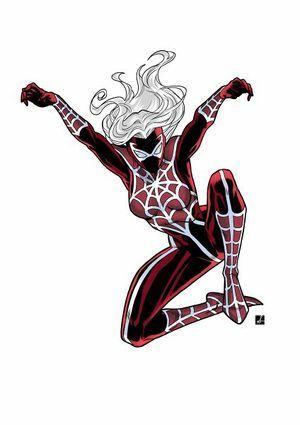 For her part, Charlotte was excited when she realized that she would have the powers of the Scarlet Spider: strength, speed, and resistance to harm. The entity that gives Widow her powers provides her superhuman strength and speed. It allows her to cling to surfaces at will, and it provides her with protection equivalent to a bullet-resistant vest. The entity is able to excrete thin adhesive strands (originally intended as safety lines during space travel), which Widow can use to swing through the city like Tarzan, or to engulf and restrain her opponents. The entity can listen and respond on radio frequencies, and Widow uses this ability in conjunction with micro-transmitters to track and follow persons of interest. The entity can also act as a computer interface, allowing Widow to mentally access computers by touching them. This page was last modified on 5 December 2014, at 10:20.